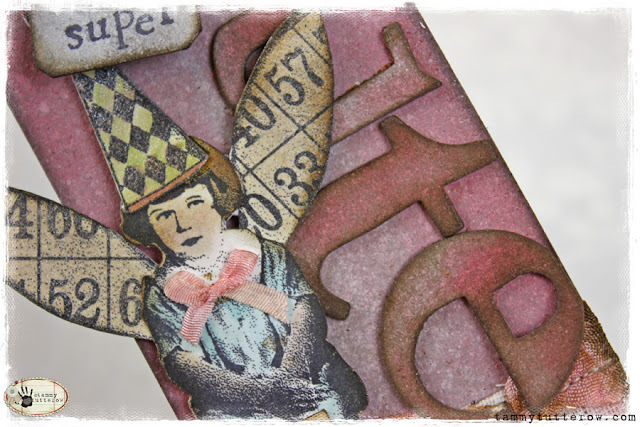 I always thought this little girl from the Winged Things 1 Tim Holtz Stampers Anonymous stamp set was super cute. When I stamped her and cut her out using the Stamp2Cut, she really came to life to me and jumped up a notch on the cuteness factor for me. To create the little girl, I stamped her three times using Jet Black Archival Stamp Ink on white cardstock. I cut her out once on the stamped outline, one time on just the outline of the girl, and one time for just the hat and words. On the first piece, the one that was the stamp outline, I used Antique Linen Distress Stain and Perfect Pearl Perfect Pearls Mist to add color and sparkle to her wings. I love that by creating her in layers, I can add special effects like misted pearly wings without misting the rest of her. For the girl, hat, and words, I used a waterbrush to apply assorted colors of Distress Stains like watercolors. When the pieces were dry, I adhered them together and brushed the edges of the assembled piece with Vintage Photo Distress Ink. Creating her in layers gives her a nice finished dimensional effect. The tag was cut from Grungepaper with the new Tag & Tie Movers & Shapers Die. 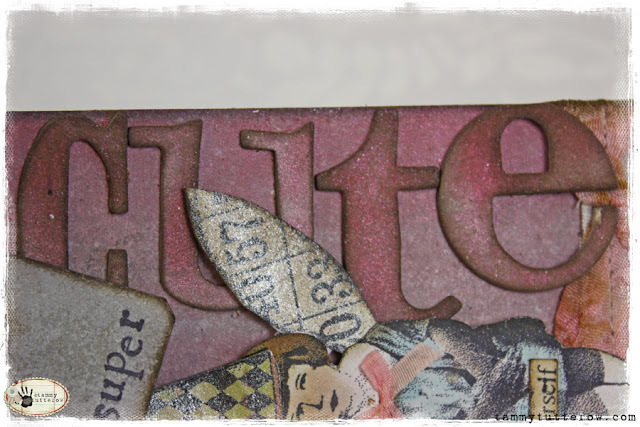 I used the new Word Play Bigz XL die to cut the C, U, T, and E letters from Grungeboard. The tag and letters were colored with Picket Fence, Antique Linen, and Spun Sugar Distress Stains. After it was dried, it was misted with Interference Red Perfect Pearls Mist. After both were dry, the edges were brushed with Vintage Photo and Black Soot Distress Ink. The tie clip was cut from Grungepaper. It was colored with Picket Fence and Antique Line Distress Stain. The edges were brushed with Vintage Photo Distress Stain. 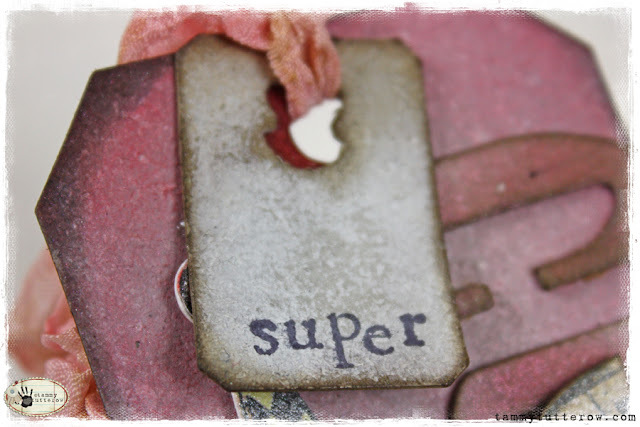 I used Jet Black Archival Ink to stamp the word "super" with individual letter stamps by Hero Arts. As a final touch, I die cut crinoline that was colored with Spun Sugar Distress Stain with the Paper Rosette strip die and used it to create a ruffle for the bottom of the tag. I sewed the ruffle and a piece of crinkle ribbon along the bottom edge of the tag. 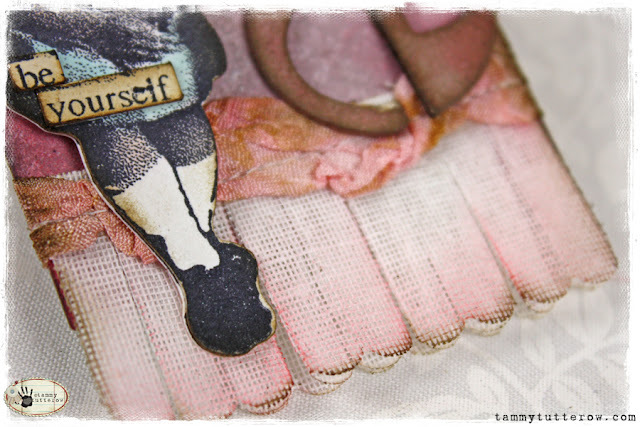 To finish off the ruffle, I brushed the edges with Vintage Photo Distress Ink. I sure do love this finished tag and the sweet little girlie on it! I keep thinking how adorable she would be on a birthday card with a stamped image of a cake on her lap. I think it would be. . . well, super cute. I love how this tag turned out! First, your color combo is wonderful. The little girl is adorable and I love the way that little bow frames her face. Beautiful job! Awesome tag - very vintage - very cute. Plus love the directions and supplies listed.. I love this combination,and tags are such fun to make. What an amazing tag! I love it! All Dena Designs, All Weekend Long at Sizzix.com! CHA Winter 2012 - Last Day - Farewell for now! CHA Winter 2012 - Last Day - eclips ecal!